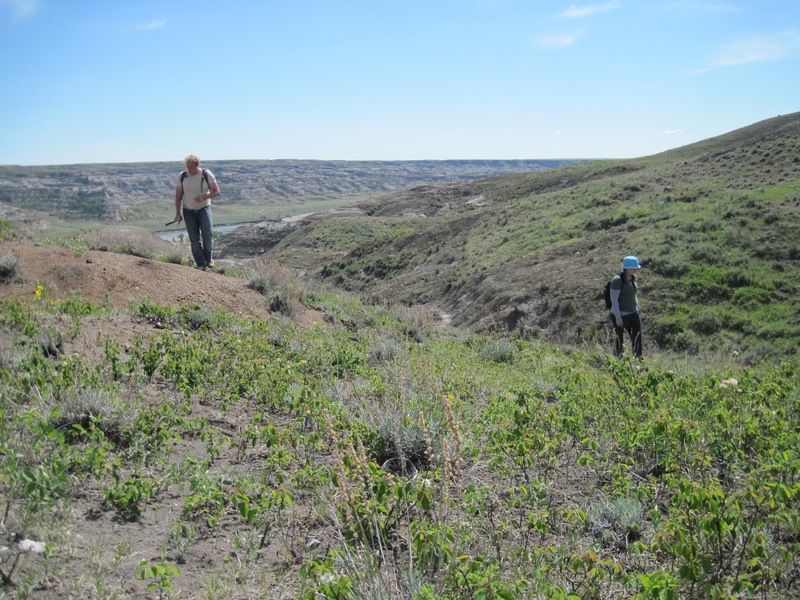 Last week I returned to Happy Jack’s at Dinosaur Provincial Park for a brief stint of fieldwork. This has been the University of Alberta’s base camp since 2008, and the area has been very productive for us. 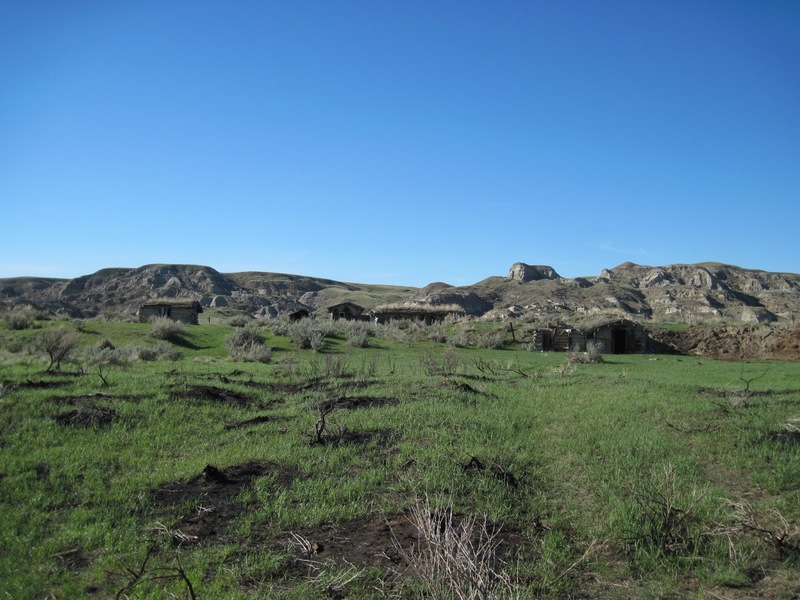 Just north of our campground is the old homestead Old Mexico Ranch, where Happy Jack lived from 1903 to 1942. A few weeks before we arrived in camp, a huge fire burnt away most of the sage bushes and other scrub at ground level. 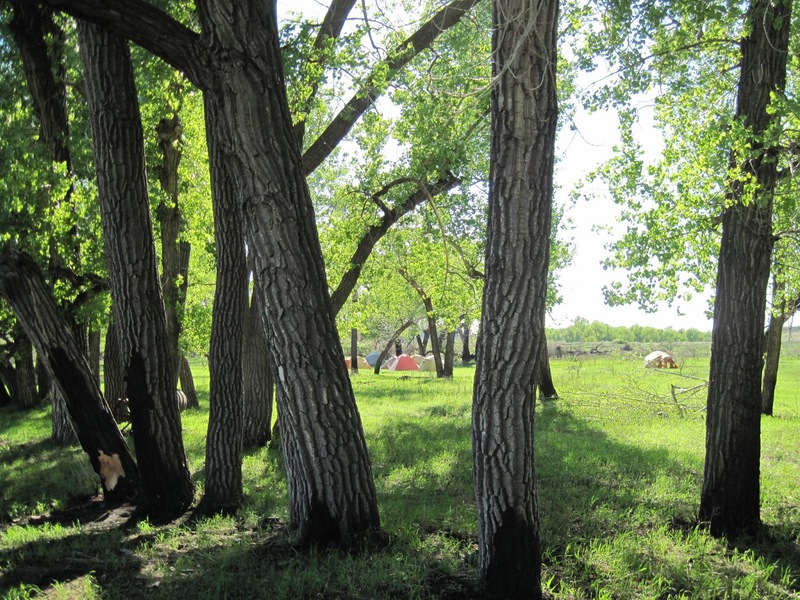 You can see scorch marks on the cottonwood trees in this photo. Windy days meant we all got pretty dirty from blowing ash. We have a pretty nice setup in camp – two large canvas tents are our supply tent and kitchen tent (and also work as a shelter during rainy days). 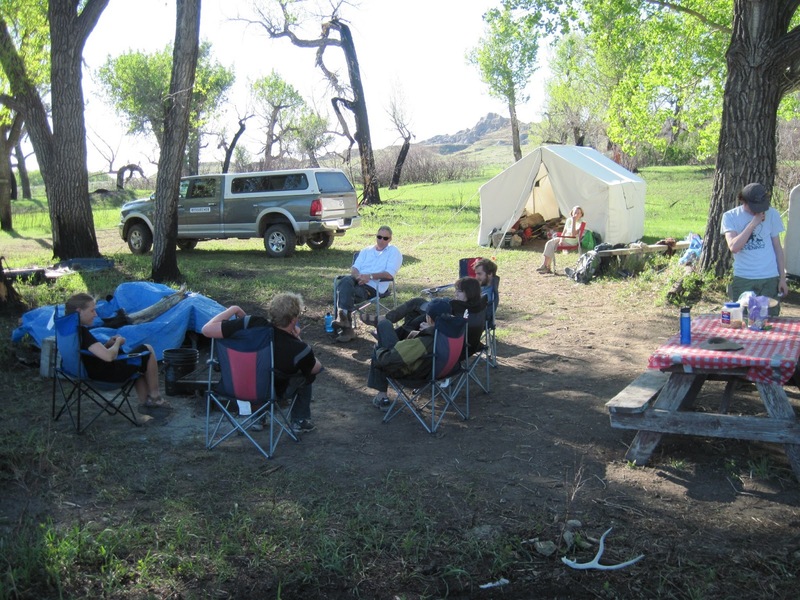 A fire pit and grill are available for cooking when there aren’t fire bans, and the river is our bathtub (although a bit silty). 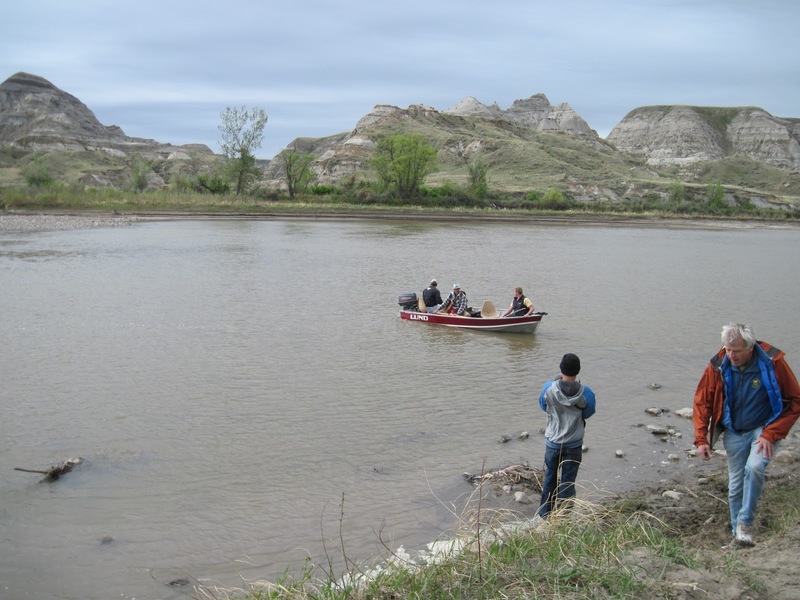 We headed across the river from Happy Jack’s to check out some possible locations for the Scolosaurus quarry. I was very grateful to be out with Darren Tanke, who has been researching the location of the quarry for quite some time, and Phil Currie. Both of them know Dinosaur Provincial Park like the back of their hands (well, their own hands). We weren’t able to pinpoint the exact location of the quarry just yet, but tantalizing clues continue to be unearthed. 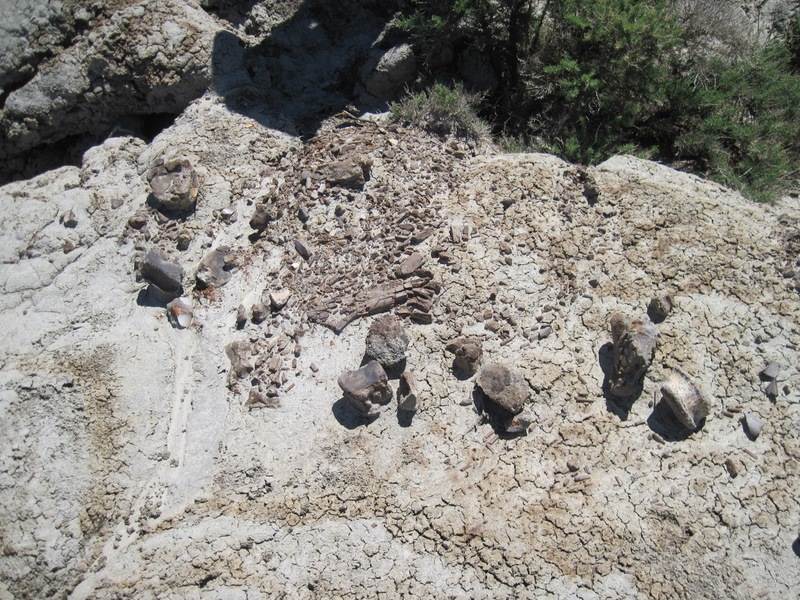 I am hopeful that one day we will be able to relocate the quarry and determine once and for all if Scolosaurus is from the Oldman or Dinosaur Park formation. 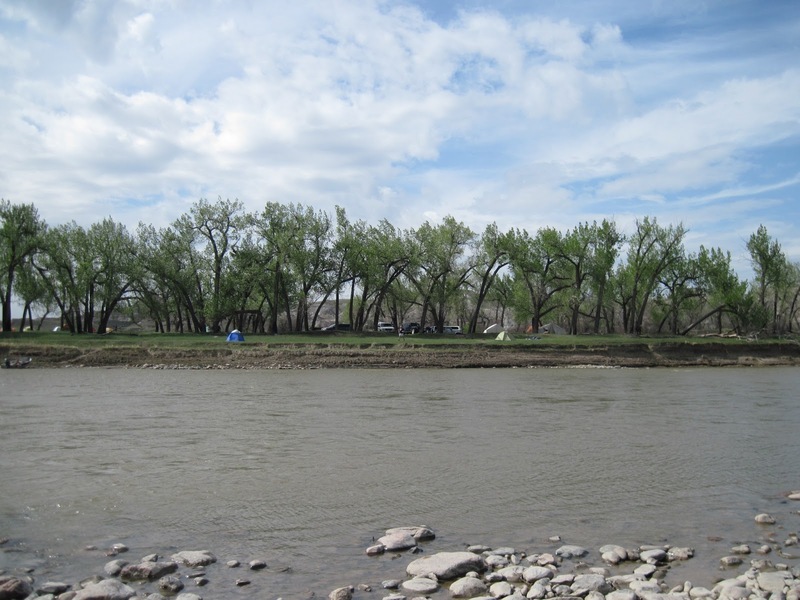 The area around Happy Jack’s, on the north side of the Red Deer River, has steeper badlands compared to the ‘core’ area of Dinosaur Provincial Park where the camping and visitor facilities are located. This means there’s slightly less accessible exposure and you have to do a lot of climbing. But, it also meant it had been prospected much less for several decades until we began working there in 2008. We’ve found several interesting and scientifically significant specimens over the last few years that are still undergoing preparation and awaiting publication, but I’m looking forward to sharing them here once they’re published! Traversing the steep slopes sometimes requires more courage than I think I am naturally equipped with, but I enjoy the challenge of navigating around this landscape. You have to watch out for sinkholes and steep dropoffs. Ironstone pebbles and dry bentonite can roll under your feet and cause you to fall and slide, so you have to be relatively surefooted. The bentonite is surprisingly sharp on your hands when it’s dry, and it isn’t pleasant to put your hands on it while climbing. (But still preferable to sticking your hand on a cactus, which I stupidly did a couple of times when I started to slide. Ouch!) 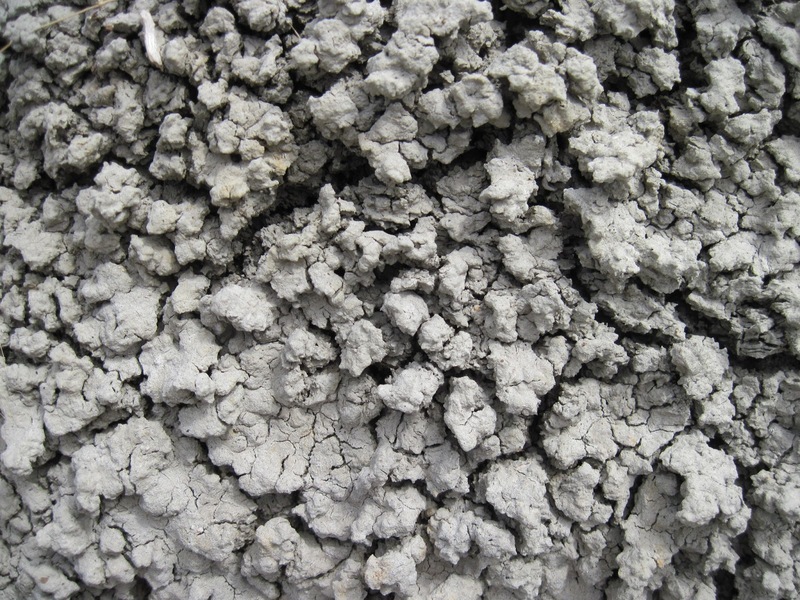 When it rains, the bentonite swells up and becomes incredibly greasy. It’s impossible to get your footing, and it gloms on to your boots. When it rains it is too treacherous for us to go hiking, but even as the bentonite is drying it can be very slippery. But the rewards of hiking around this terrain are well, well worth it. 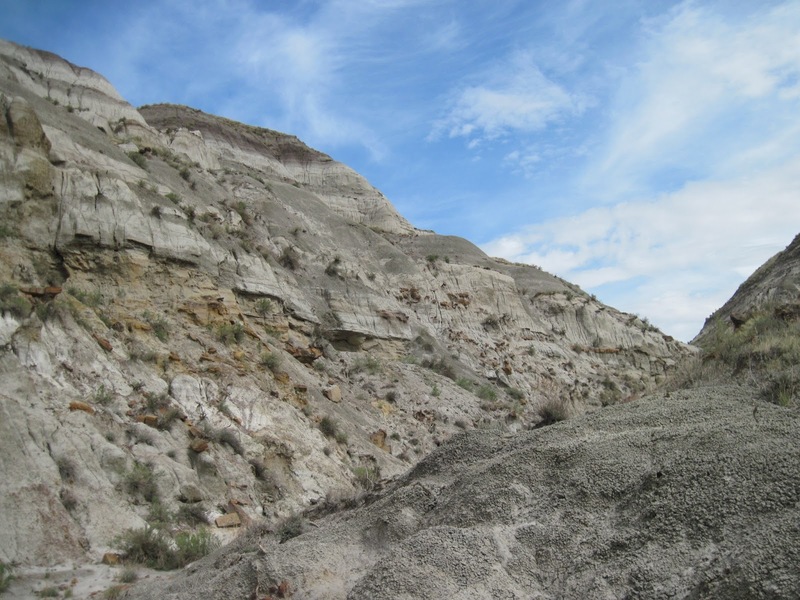 It is almost impossible to walk around Dinosaur Provincial Park without finding at least some bone. The trick is finding stuff that is worth collecting – the volume of bone is so high that we cannot possibly collect all of it, so we need to be somewhat choosy in what we bring back to the university. (No hadrosaur caudal centra allowed, unless they are pathological!) 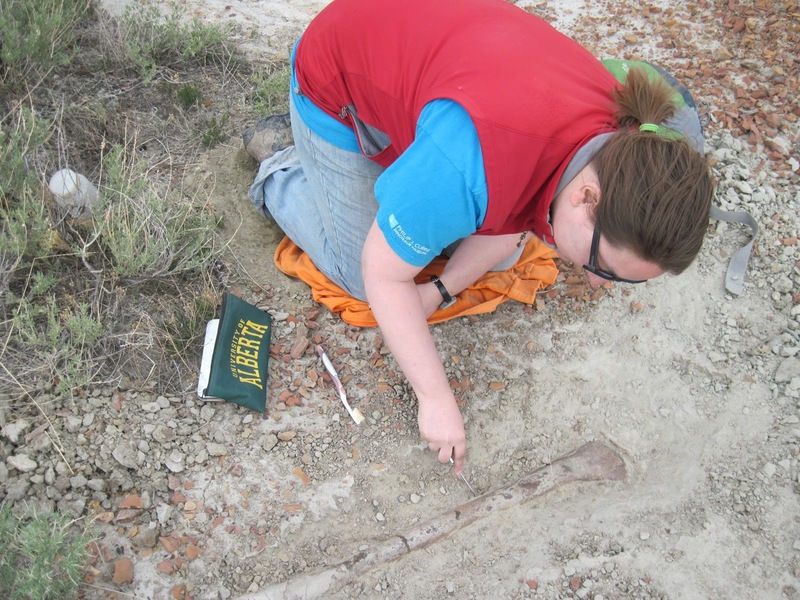 The bones in this picture are the weathered remains of a hadrosaur. They were too far gone to collect, but we recorded their location with a GPS. 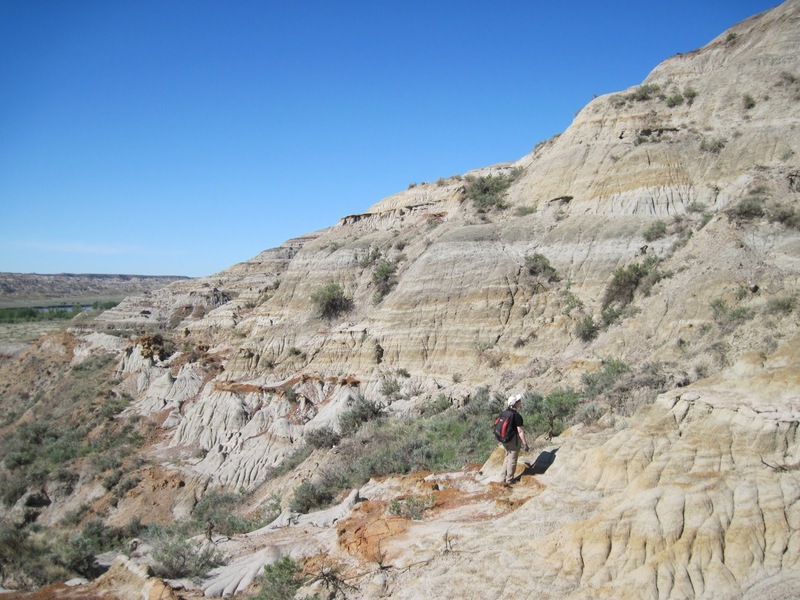 We keep a database of uncollected dinosaur skeletons in the park, for understanding relative dinosaur diversity geographically and stratigraphically. I was happy to find this nicely preserved ?fibula on the second day of fieldwork. Just a little piece of one end was showing, but it was obviously still going into the ground, so I decided to pick a little bit at it. I’m glad I did! 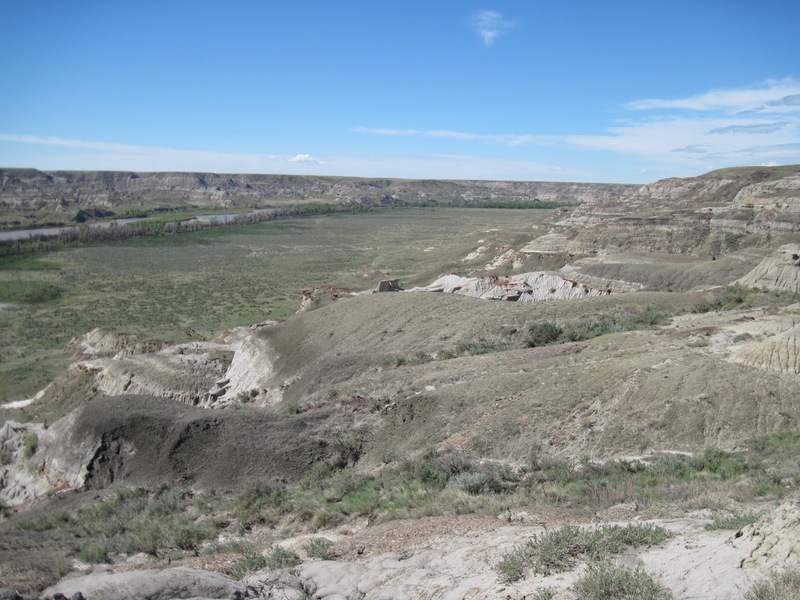 On my last afternoon in the park, we spent an hour or so prospecting in the marine Bearpaw Formation, which overlies the terrestrial Dinosaur Park Formation. I don’t usually spend a lot of time looking in the Bearpaw, so this was neat for me. The Bearpaw is usually a dark grey shale, but at this spot in the prairie it is weathering out a bit reddish. You can see a couple of white chert nodules in the bottom left corner – these often had chunks of large ammonites, or sometimes clams or bryozoans! ← Who-oplocephalus: Everything old is new again.